While the performances of athletes have hogged much of the spotlight at the Pyeongchang Olympics, it’s been hard to ignore the stuffed tigers the winners have received on the podium at the conclusion of their events. 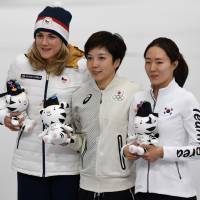 In December, the Pyeongchang Organizing Committee announced that medalists would receive a doll of the games mascot wearing a gold, silver or bronze hat and a paper flower. They would subsequently receive their medals at a ceremony held at the end of each day. The white tiger has been named Soohorang and, according to the official Pyeongchang 2018 Olympic and Paralympic Winter Games website, is said to be regarded as a sacred guardian animal symbolizing trust, strength and protection on the Korean Peninsula. Its name is a portmanteau of the words “sooho,” which means “protection” in Korean, and “rang,” which, according to the official Olympics website, has a double meaning. ‘“Rang” forms part of “horangi,” the Korean word for “tiger,” and is also the last part of “Jeong-seon Arirang,” a traditional folk song of Gangwon, the province in South Korea where the games are being held. Bandabi, the mascot of the Paralympic Winter Games, is an Asiatic black bear with a half moon on its chest. The Asiatic black bear symbolizes strong willpower and courage in Korean mythology, characteristics that underpin the overall Olympic theme of equality and harmony. The name is a portmanteau of “ban-dal,” the Korean word for half-moon, and “bi,” which stands for celebration of the games. Soohorang has experienced a few wobbles since it first appeared in public to promote the games. First, its designers discovered that it was difficult for the mascot to pass through standard doorways without getting stuck. Then, those charged with wearing the outfit complained that it was hard to see properly because the eyes had been positioned too far apart from each other. Online reactions, however, were mostly positive. “The Soohorang plush awarded to medalists at the flower ceremony is so cute. You can also purchase them online,” says Twitter user @Mpj72610Yukako. Twitter user @chiro_desu celebrated the Olympics by making Soohorang and Bandabi character bentos, which are also known as chara-ben, a creative bento that involves a high level of artistic skill. Mascots have also been at the center of discussion for the Tokyo 2020 Olympic and Paralympic Games. Three design options were revealed in December and, according to the Tokyo Organizing Committee of the Olympic and Paralympic Games website, each set of characters has different meanings. The first options are checker-patterned. The Olympic option is represented by a combination of traditional and neo-futuristic colors, while the Paralympics design has a cherry blossom appearance and possesses supernatural powers. The second options comprise of an Olympic mascot that has been inspired by the sacred foxes of Shinto shrines, while the Paralympic design draws from the shrines’ guardian dogs. The final options consist of an Olympic mascot inspired by a combination of fox and an ancient Japanese curved jewel, along with a Paralympic design derived from the supernatural raccoons of ancient folk tales. What’s more, the Tokyo options have come off second best when compared to the mascots at the center of the Pyeongchang Games. “The difference in cuteness is vast,” says Twitter user @in_mi_nim. The Tokyo Organizing Committee asked elementary school children nationwide to vote for the mascot they liked best. The winner will be announced on Feb. 28, with the names being chosen by experts and made public in July or August. “The mascots have been designed to embody the collective will of everyone for the successful hosting of the Olympic and Paralympic Games in 2018, and experts of various fields contributed to the process,” Pyeongchang Organizing Committee President Lee Hee-beom says. With the mascots chosen to be face of the Pyeongchang Olympic and Paralympic Olympics proving to be popular with fans, one can only hope that the design that is selected to lead Tokyo in 2020 on Wednesday captures the imagination of the public in the same way. The jury’s still out on that one, though.